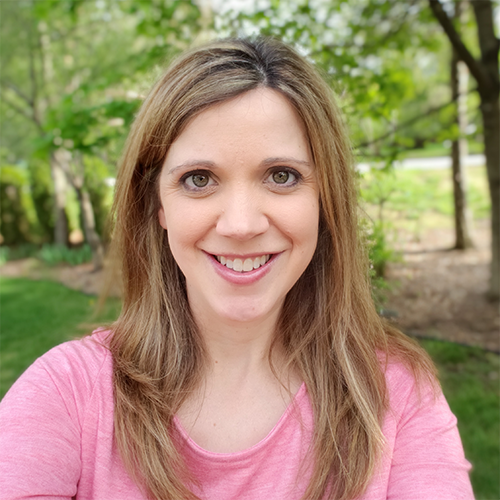 Last week, I blogged about why I love using Tailwind to schedule my Pinterest pins for my business. You can check that out HERE. This week I'm digging a little deeper to explain how to get started on Tailwind. I know it can be overwhelming at first, but I really think it can help your business and ultimately save you time. Now, this is designed for businesses that are targeting a specific audience, want to build their following, want their products to be seen, etc. My personal Pinterest account that I started years ago and pretty much just use for recipes now doesn't need Tailwind and scheduled pins because it is really just for me and I don't use it to connect with others. You can start with a free trial to get you started. I started with a free month and before the month was even up, I upgraded to Tailwind Plus. That version is about $10 a month or you get a discount if you pay for the whole year up front. Once you've signed up and link your Pinterest account, you are going to be thinking, now what? I avoided it for the first few days because I wasn't even sure where to start. My advice is before you do any pinning, watch the tutorials and video guides that Tailwind includes. Many of them will automatically pop up the first few times you sign in. These are often very short and show you exactly how to use the program. Explore these and the FAQs and you should get a feel for what you are seeing on your dashboard. The next thing you are going to want to do is complete your account. 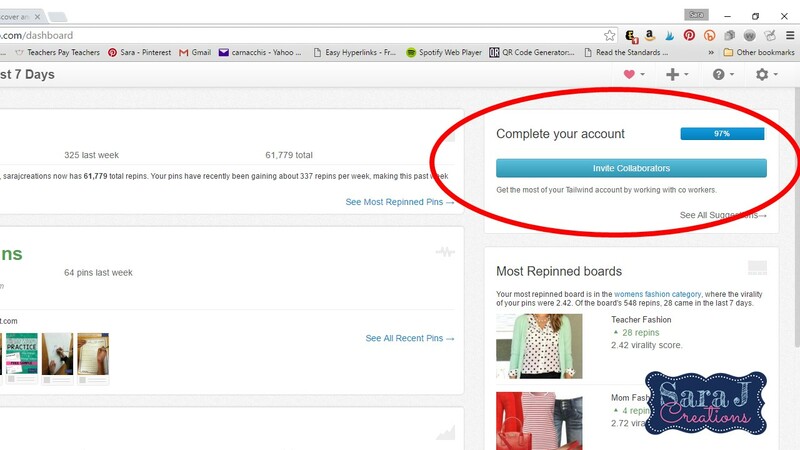 In the upper right corner of your dashboard you will see the complete your account section and it will tell you what % you have completed. These are suggestions that Tailwind is giving you to improve your Pinterest account. For me this meant adding descriptions to all of my boards and adding pins to some of my boards (they suggest a minimum of 10 pins on a board and some of my new boards didn't even have that). I spent some time going through this and making my boards the best they could be based on Tailwind's suggestions. Start here!! After that, make yourself familiar with what you have available to you. The first is to figure out what times you are going to pin at. Tailwind looks at your pins, your target audience and when they are most active and engaged with your pins and gives you time suggestions based on that. 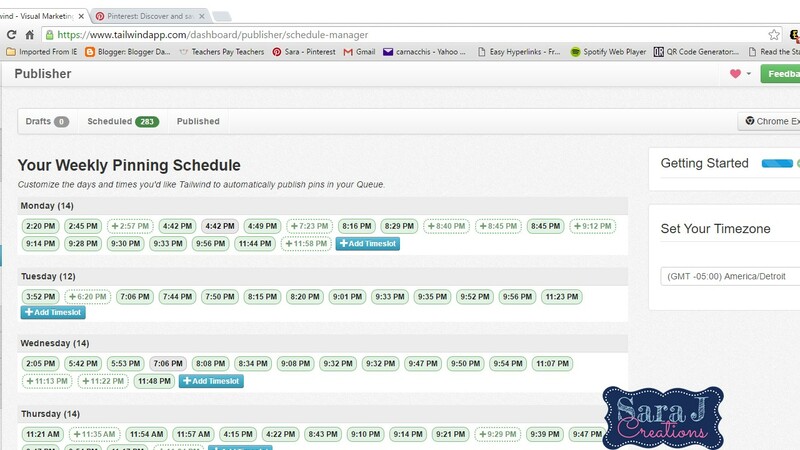 On the left side find the Publish section and then Your Schedule. You will see the different time options. You can click the plus sign on the faded gray times and those will then be added to your schedule. You can also add your own time but I chose to just stick with what Tailwind suggested. I'm going to warn you to BE CAREFUL HERE. Don't bite off more than you can chew. I added all of their suggested times and then came back the next day and noticed they had more suggested times and I added those. But guess what, they just keep suggesting times if you keep adding them. So my advice is to decide what you can handle (and start small) and just stop there. You can always add more later. If you pick to have 50 pins scheduled each day, then you need to find 50 pins daily that you want pinned. This is a lot of work! I have between 9 and 18 pins a day (depending on the day). Right now this is manageable for me. Also, remember this is not just your product pins. This will be pins from your blog, other pins you find on pinterest, pins from other blogs, etc. Only about 25% of my pins are for my own products. Most of them are just repinning things I like on Pinterest and building up my boards with great ideas. After this you can play around with your statistics and kind of see where you are starting at and what information is available to you. The free version has limited statistics. As I mentioned in my why I love Tailwind post, this part can still be a little overwhelming to me and I definitely under utilize this feature. I know that my stats are improving and since joining Tailwind I've gained more followers and gotten more repins than when I was just pinning on my own - that's about all I need to know. 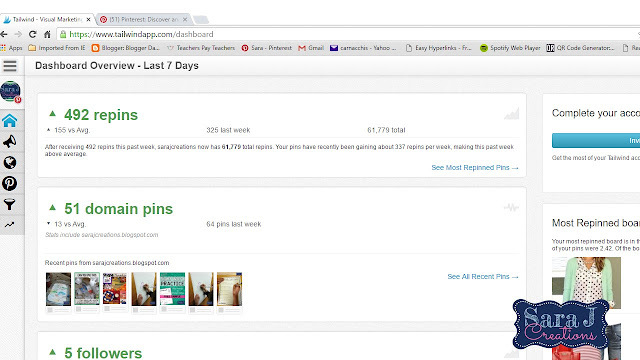 If you have a blog you can monitor it through Tailwind and see what is being pinned from your site. 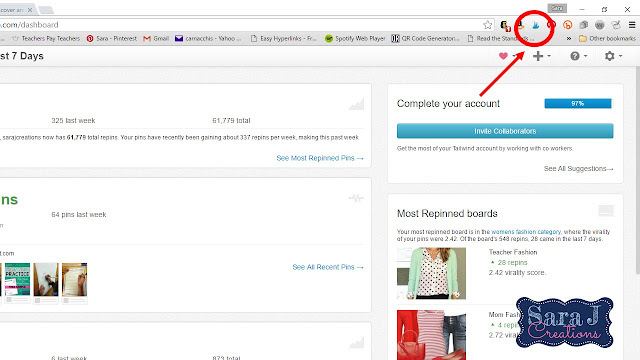 You can also monitor your Pinterest page and keep track of followers, pins, repins and likes. I usually look at the weekly summary which is the house icon on the left side of the screen. This shows your repins and followers for the past 7 days. It will then tell you what you usually get in a week and if you are above or below your normal average for this week. The last thing I would do to get started before you begin scheduling is add the Tailwind Add On (Google Chrome Extension is what I have) to your web browser. NOTE: This extension is for desktops. They are not designed for mobile use. However, they are launching an Apple app soon to help with this. Adding this extension is similar to adding the Pinterest extension. Now any site that you go to, you can hover over the picture and you will see Pin It and you will see Schedule or you can click the symbol at the top and it will bring up the pictures for you to choose to schedule. You are going to start using the schedule feature and delay your pinning. It was sort of a mindset change for me. When I saw something I liked on Pinterest or on a blog, I would generally pin it right then. Now I schedule it and save it to my drafts and then schedule it out at a peak time. This is great Sara J! Thank you so much for all the details! I'm going to try your suggestions and keeping my fingers crossed! Thank you Love! You're welcome. Let me know if you have questions along the way.